I continue to lumber my way through the details of various AKs that I've found over the years. I've just discovered another one that I've totally untapped: Kidd AK. Which is a weird one because it only appeared after WW I. I've just never extracted the data from Kidd's post-war records. More of that later. We're here to discuss Crowley AK. More specifically, its grists during the years of WW I. That's yet another double obsession hit: AK and WW I. Is it me who's lucky or you? MAybe it's both of us. At least Crowly's version is a bit more interesting than the last lot of Fullers AK we lookd at. No shock there, as the table covers war years. Always lots going on then. At least in terems of gravity. Which, as you can see, dropped steadil until the summer of 1918, after which it rose again. Though it still ended lower than in 1914. 24% lower, to be precise. 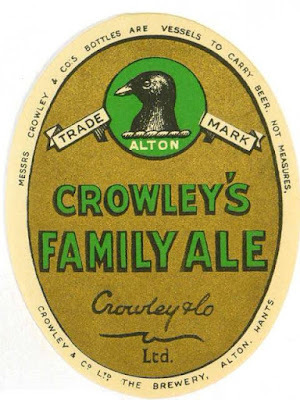 Crowley's beers, though not all-malt before the war, certainly contained a high percentage of malt. In the case of AK, at least 90%. During the later war years, it really did go al malt. Probably because they were having trouble getting the type of sugar they wanted. CDM stands for Caramelised Dextro-Maltose, in case you're wondering. It's a sugar that was used for colouring purposes. Not sure what Laevuline is, but Laevulose is an old name for fructose. I suspect that it's either fructose or something similar. Odd that Crowly threw some choclate malt in the grist in late 1918. I assume that was for colouring purposes. Brewing record held at Hampshire Archives and Local Studies, document number 37M86/2. Laevuline was heavily advertised by F Kendall & Sons of Stratford in this Brewers Journal of 1946 as "The Priming That Made Light Beer Popular" and emphasising the economic attractions. Corn syrup maybe?